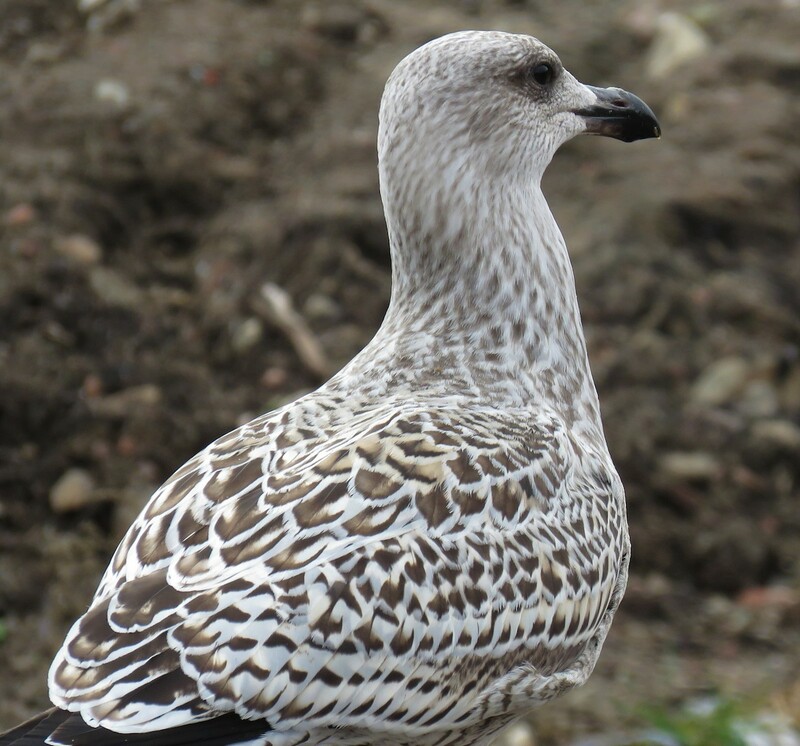 Photo: A striking juvenile “Northern” Herring Gull. 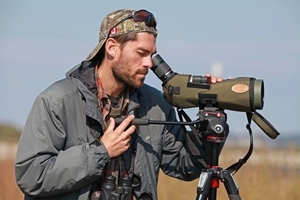 These northern birds are typically deep brown and retain juvenal plumage late into the fall. 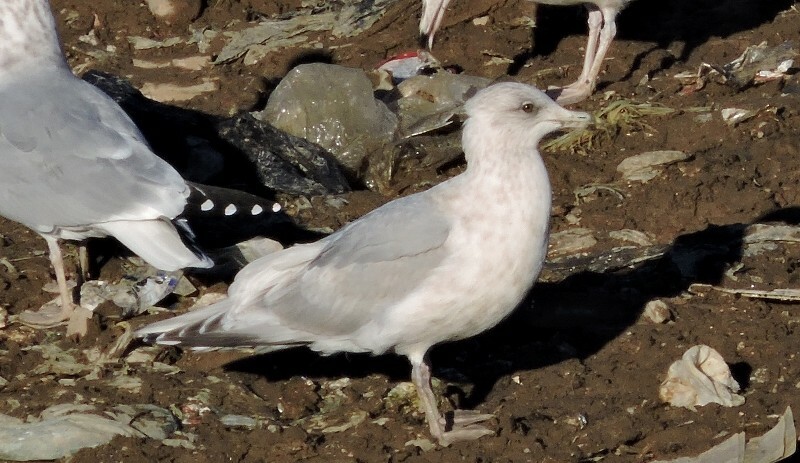 Note the complete set of “frost”-edged juvenal scapulars on this bird; not a single feather has been replaced, or, moulted. 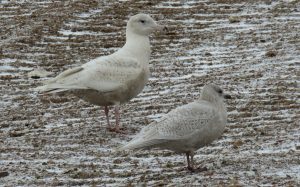 They more or less share an Arctic moult timing, like Iceland and Glaucous gulls. It’s the Arctic moult timing that most strongly points to northern lineage. 9 November 2017. 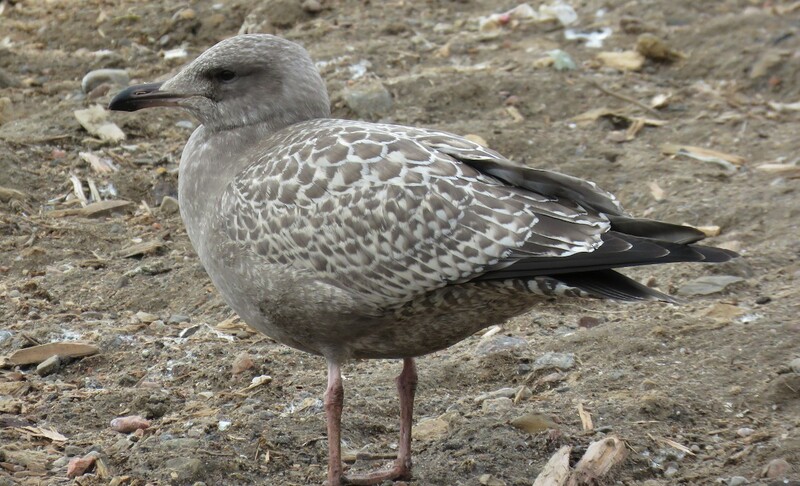 Photo: Another juvenile northern Herring; a real beefcake of a bird, this one. 9 November 2017. Photo: An example of a “Southern” Herring (left) and a “Northern” Herring (right). 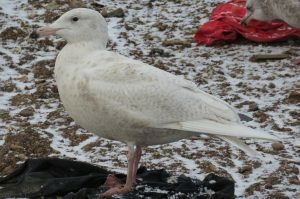 The southern bird has a complete set of replaced scapulars, whereas the northern bird is in juvenal plumage, like, for example, an Iceland or Glaucous Gull at this same date. 9 November 2017. 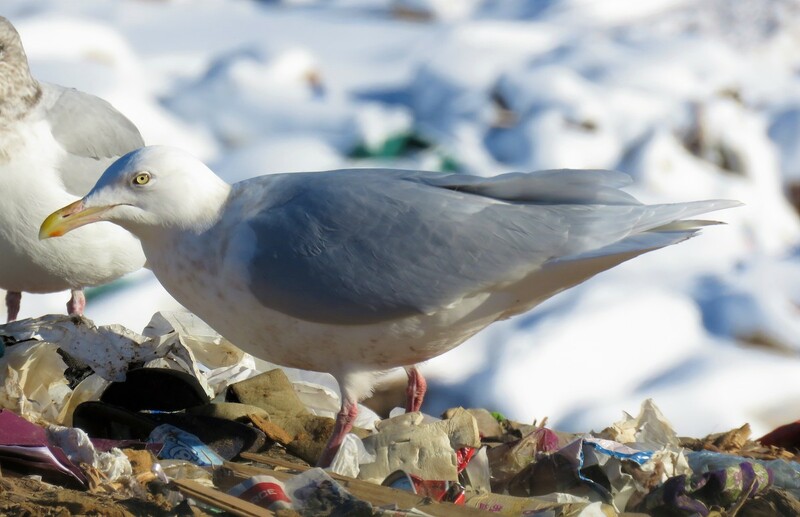 Photo: This adult is by far the most beastly and amazing-looking Herring I’ve seen at the Waste Facility! This extent of winter head-streaking is not common in my experience. Truly a “hooded” appearance. 27 November 2017. 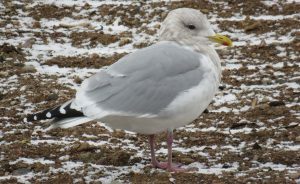 Photo: An adult Herring Gull with nice head streaking. 7 December 2017. 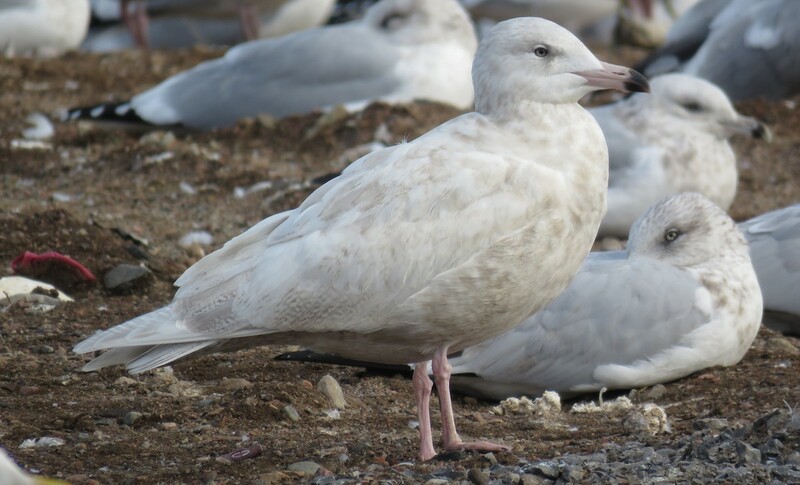 Photo: A juvenile Iceland (Kumlien’s) in all its delicate and dainty glory. Lovely bird. 27 November 2017. 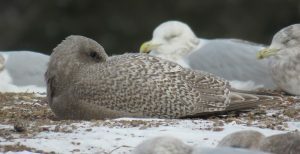 Photo: Juvenile Glaucous with a juvenile Iceland. Which is which? 27 November 2017. 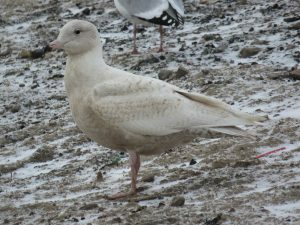 Photo: A lovely, whitish juvenile Iceland (Kumlien’s); the same bird as the first photo in the Iceland series. 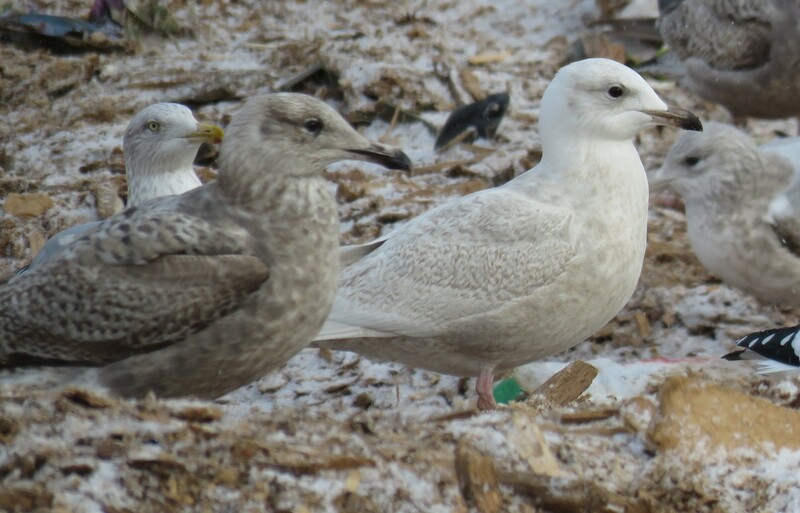 Pictured here with a first-winter Herring Gull. 27 November 2017. Photo: Juvenile Iceland Gull paired with a…..? 27 November 2017. 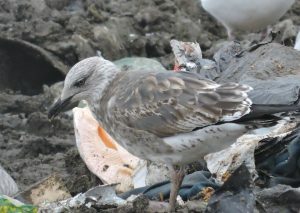 Photo: A juvenile Iceland (Thayer’s) Gull is truly beautiful to behold. 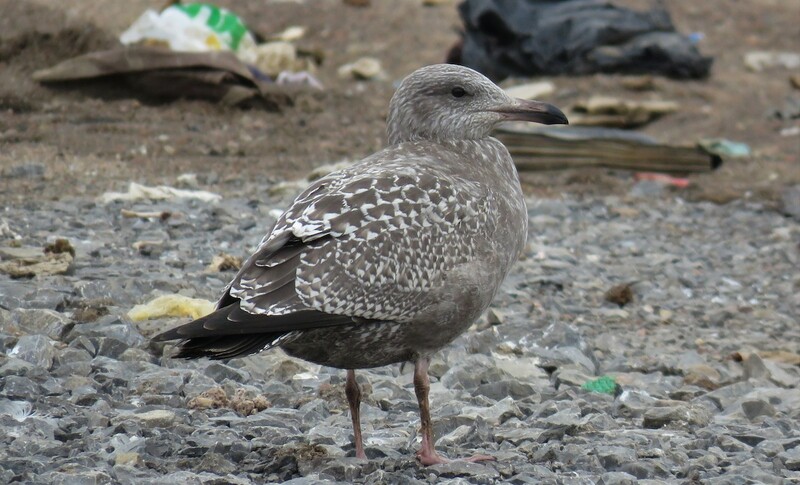 In my opinion, the most beautiful of the juvenile gulls. Their patterning and plumage detail, when viewed up close, is breathtaking. 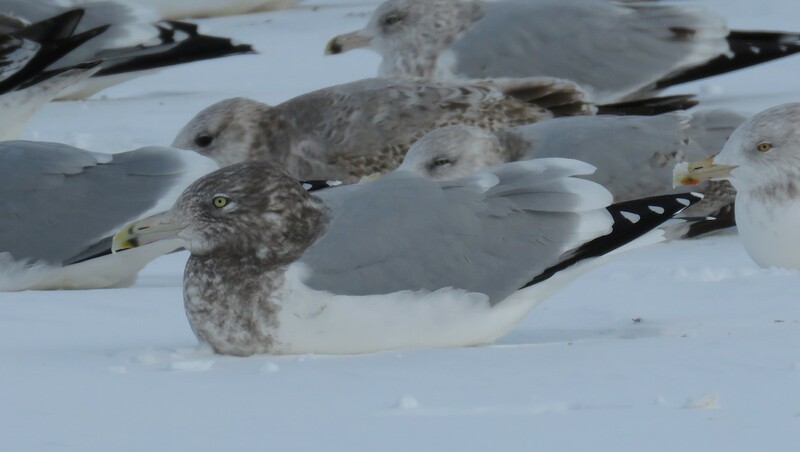 Interestingly, this bird may not pass the “Thayer’s test” on the west coast, but here in eastern Ontario, it just passes, in terms of the depth of brown to the tertials and the primaries. Thayer’s ID is subjective and highly nuanced, in my experience. 27 November 2017. 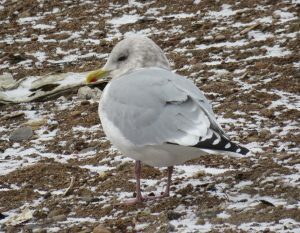 Photo: This adult Iceland (Thayer’s) was my first self-found Thayer’s in eastern Ontario. I was thrilled with the find, and with the chance to study the bird up close. 7 December 2017. 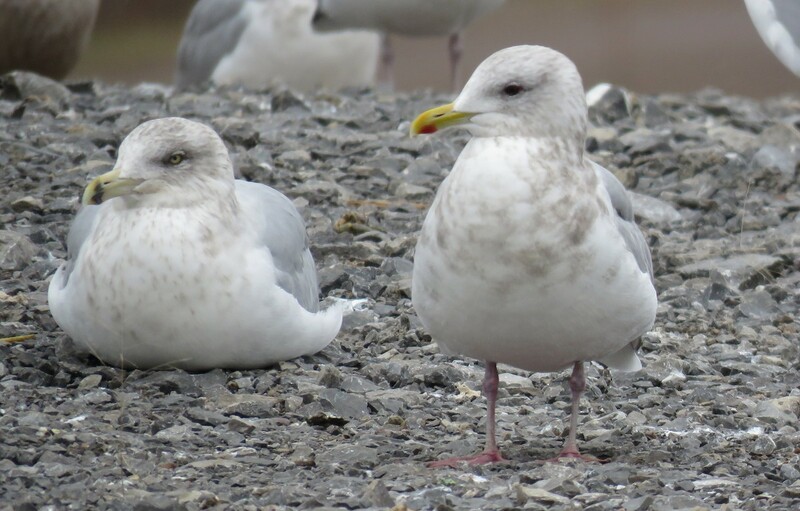 Photo: Adult Iceland (Thayer’s) Gull. Note the rich pink leg colour and just how short the legs are! The primary pattern is akin to a west-coast Thayer’s; as in, there’s no denying that this is a Thayer’s! 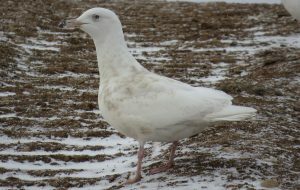 The dark irides, along with the blotchy winter head streaking, are typical of the sub-species. 7 December 2017. 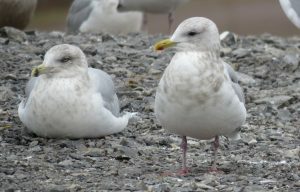 Photo: Adult Iceland (Thayer’s) Gull. 7 December 2017. 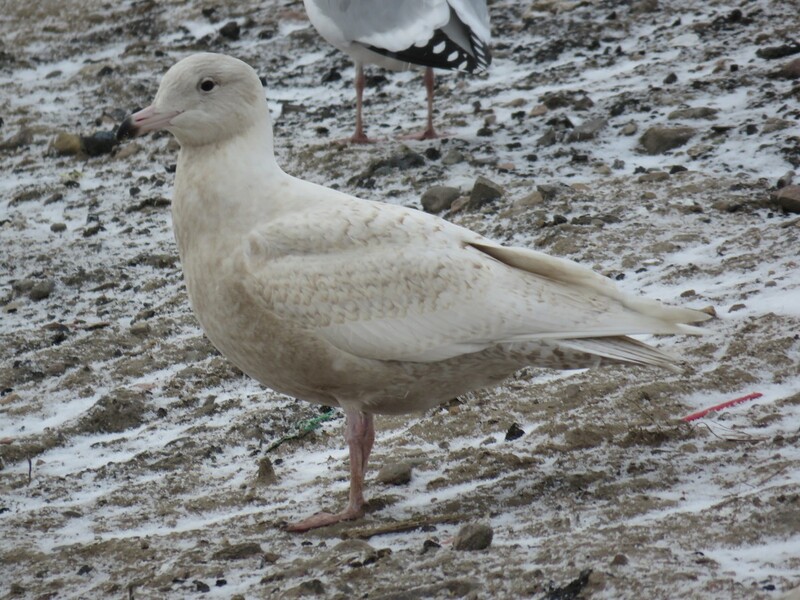 Photo: This third-cycle Iceland is perhaps best left unclassified. One crack Larophile recommended that a Thayer’s label is applied, while another recommended it be left unclassified. I couldn’t decide myself, so I left it as an unclassified Iceland. 16 November 2015. 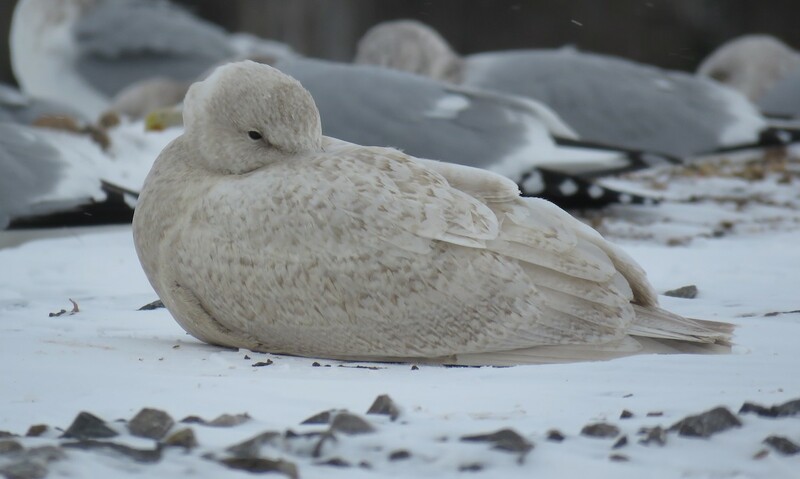 Photo: A juvenile Glaucous Gull roosting. 27 November 2017. 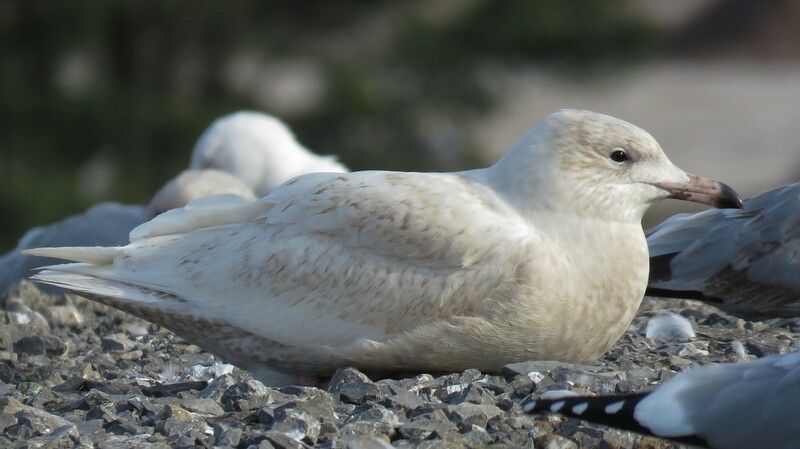 Photo: A juvenile Glaucous Gull. 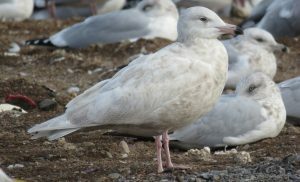 Note the dark eye; evenly-thick, bicoloured bill; the impression of great mass throughout the body; and the short wings, i.e., short primary projection beyond the tail. Photo: Juvenile Glaucous Gull. 27 November 2017. 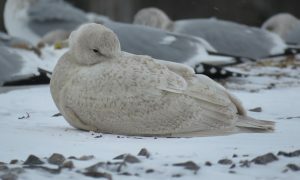 Photo: An enormous juvenile Glaucous Gull. 27 November 2017. Photo: Juvenile Glaucous Gull. 22 November 2018. 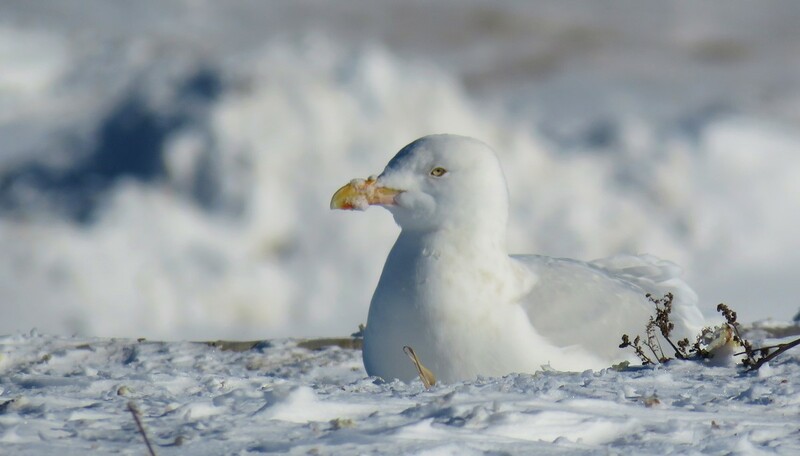 Photo: A second-winter Glaucous Gull. 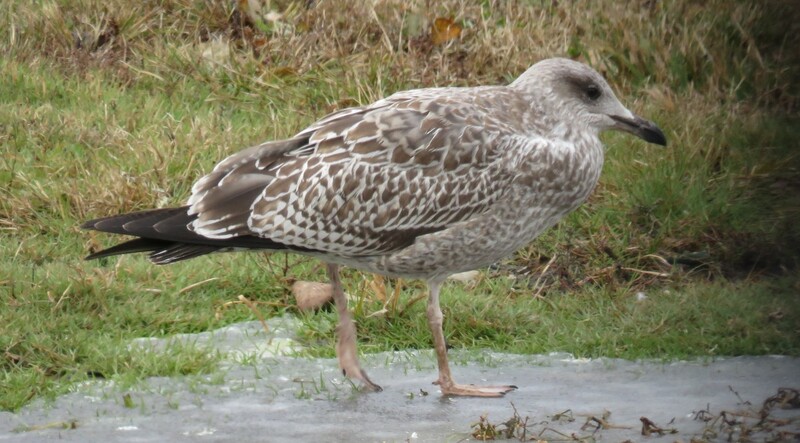 Note the light eye (light iris); the dusky/splotchy brown throughout the plumage; and the fascinating vermiculated patterning through the greater coverts and the tertials. Note, as well, the relatively short wing projection beyond the tail. Photo: A beautiful second-winter Glaucous Gull. 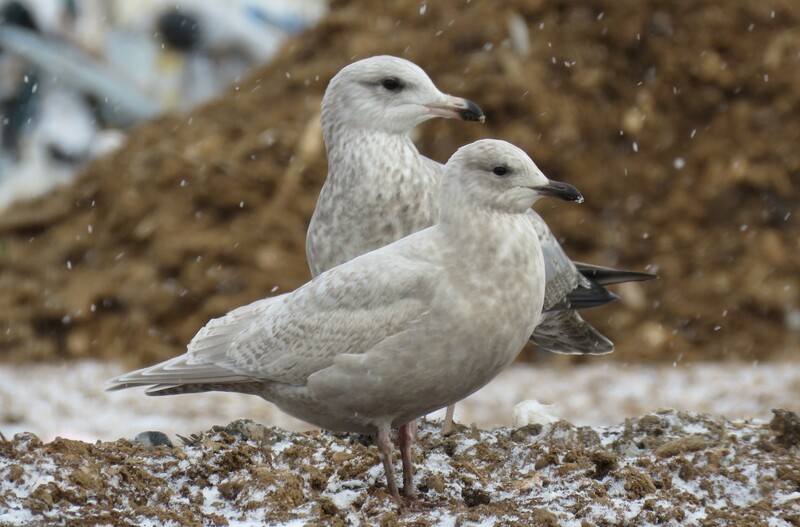 Yet another close look at these beautiful Arctic gulls thanks to the staff at the OVWRC. 7 December 2017. 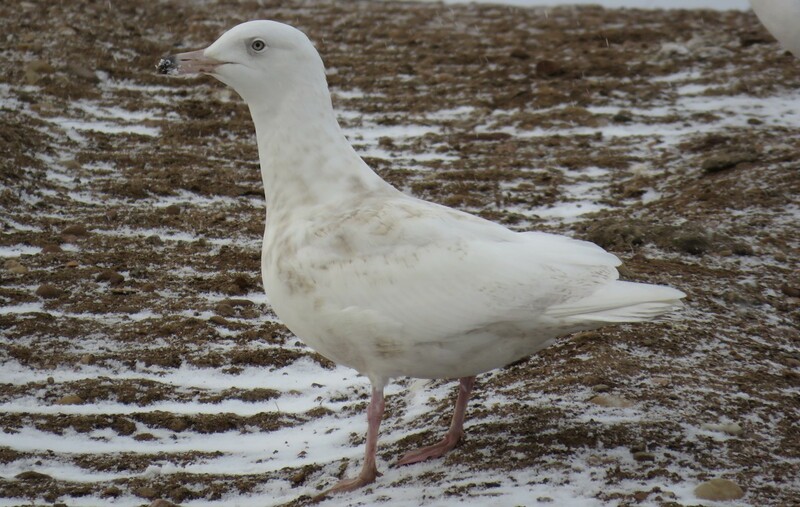 Photo: A smaller, more delicately-balanced adult Glaucous Gull. Perhaps a female. It was roughly the same size as nearby large Herring Gulls. The bill size and shape, very light mantle shade (not showing well in this particular photo) and the short wingtip projection beyond the tail favoured Glaucous over a large Iceland. 22 November 2018. 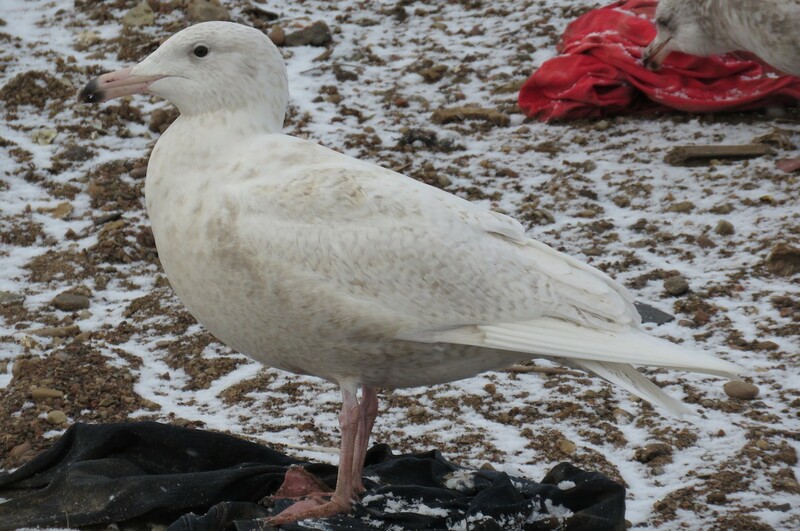 Photo: Adult Glaucous Gull in all its glory. 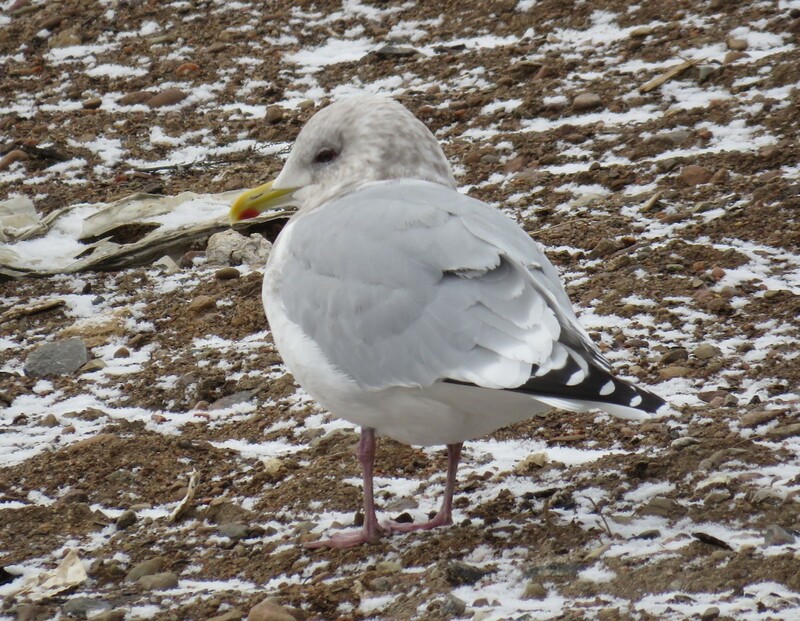 Look how beady the eye is on this bird; it is massive and was even slightly larger than a nearby first-winter Great Black-backed Gull. 22 November 2018. 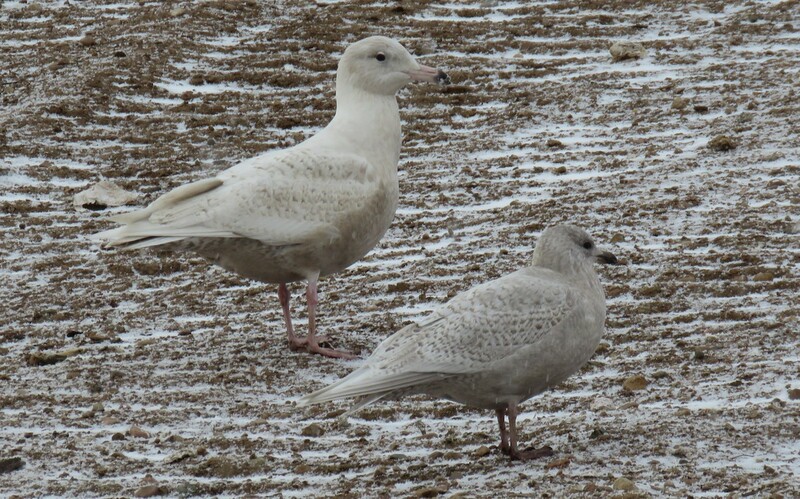 Photo: Adult Glaucous at the front with a juvenile Glaucous at the rear. 22 November 2018. 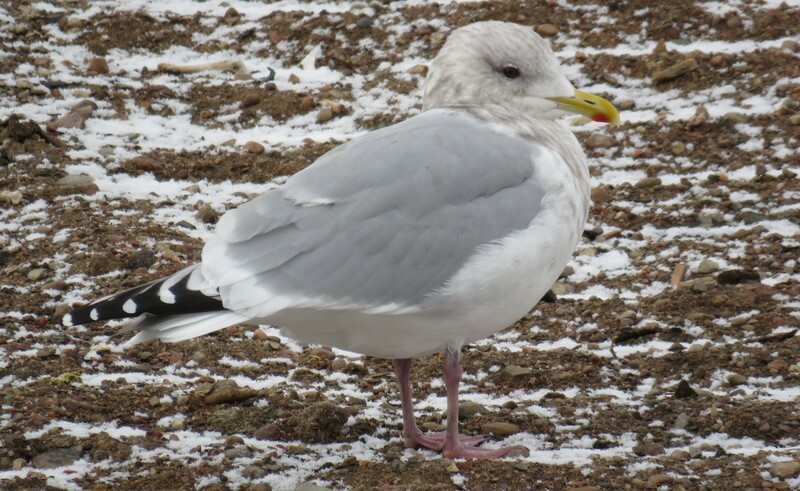 Photo: A third-winter Lesser Black-backed Gull. 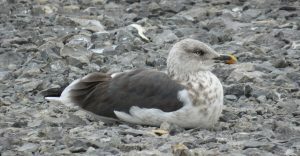 In my opinion, any immature plumage to a Lesser Black-backed is going to make for an awesome photo study! 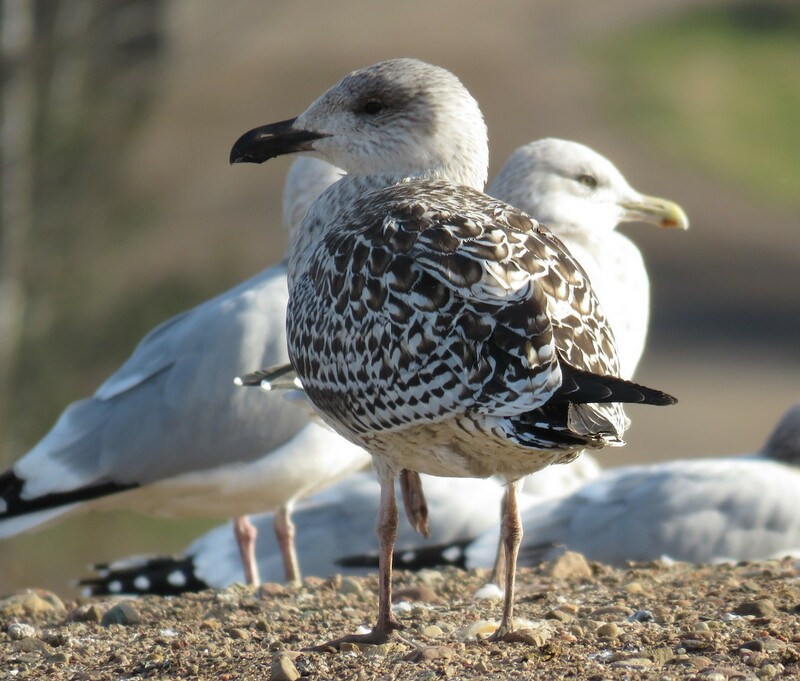 They are fabulous gulls, aren’t they? Just check out that bill, for example. 9 November 2017. Photo: The same third-winter Lesser Black-backed Gull as above. Lovely bird! 9 November 2017. Photo: A second-winter Lesser Black-backed Gull. 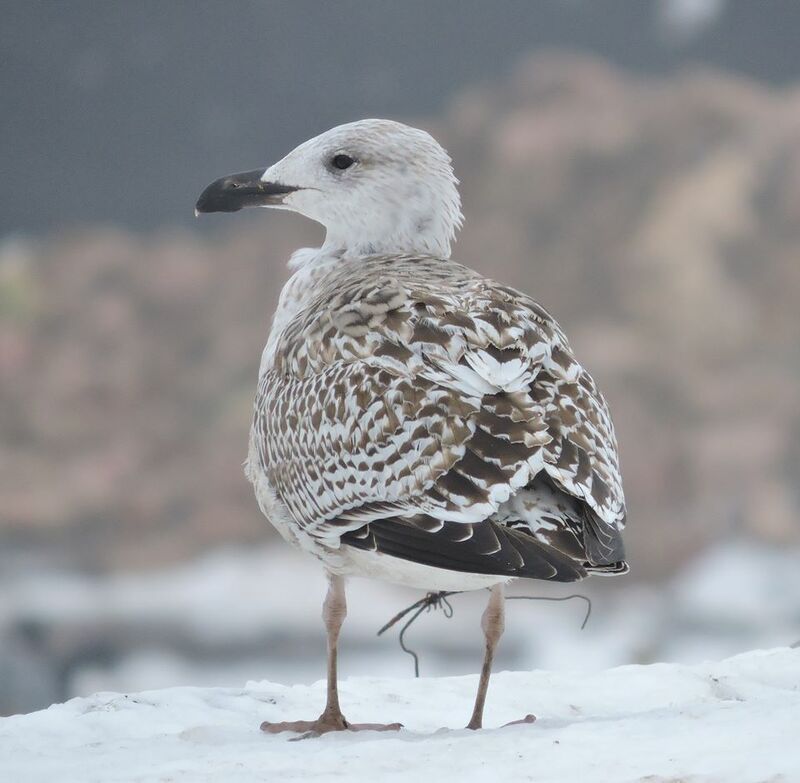 Second winter Lesser Black-backed…what a wild-looking gull! 29 November 2016. Photo: A first-winter Lesser Black-backed Gull. 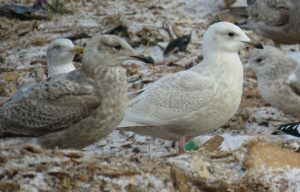 Note the first-basic (first winter) scapulars (different internal patterning and different border), signifying first-winter plumage. 27 November 2017. 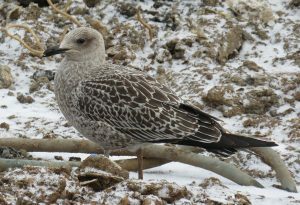 Photo: A crisp and beautifully-plumaged juvenile Lesser Black-backed Gull. Note the “cold” base colour to a Lesser Black-backed’s plumage. 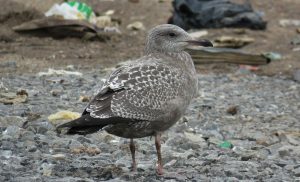 Note also the all-black bill and the attenuated shape, derived from the long, black wingtips jutting past the tail tip. 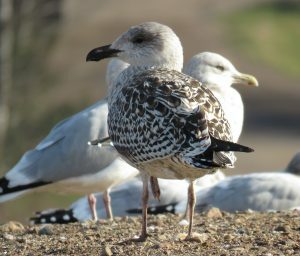 Photo: A juvenile Great Black-backed Gull. 9 November 2017. 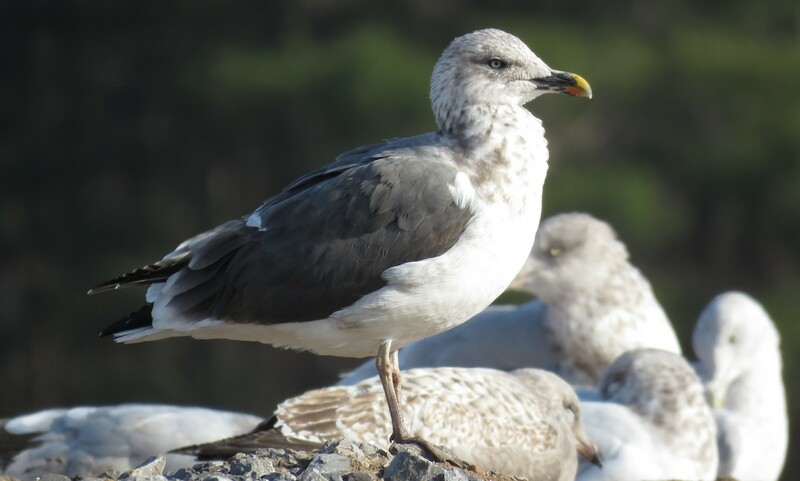 Photo: A first-winter Great Black-backed Gull. 29 November 2016. Photo: A juvenile Great Black-backed Gull. Note the uniformity of the upper scapulars; they are uniform in their appearance and are all the same “age.” Note the difference to the above bird. Can you see the first-basic (first winter) scapulars on the above bird? They have a different internal patterning, as well as a different border. 15 November 2017. Photo: Great Black-backed’s are massive gulls; the largest gull species in the world! 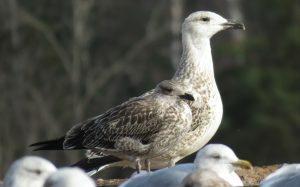 Here’s one with a juvenile Lesser Black-backed Gull. 7 December 2017. I firstly thank the staff at the OVWRC for being so kind and accommodating over the years! It is wonderful to be able to drive into the Waste Facility itself to study the gulls. I am greatly appreciative. 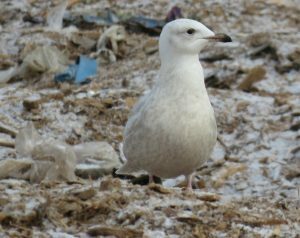 Thanks also to Kevin McLaughlin, Mark Gawn, Amar Ayash and Brandon Holden for their expert commentary on gull ID over the past three-to-four years. 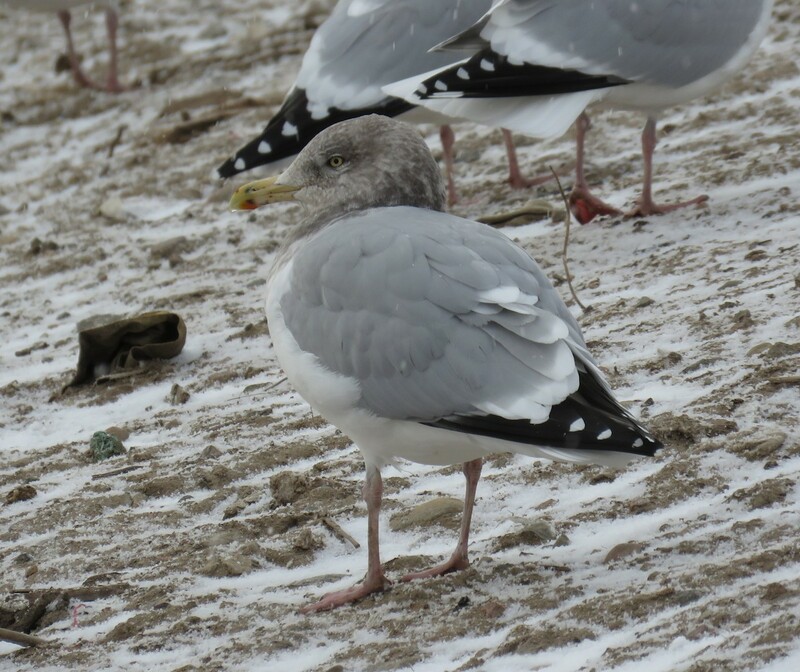 I hopefully will have to one day send photos of a putative Slaty-backed for their “signing off” on the ID before alerting the Ontario birding community!